The familiar Alberta Hunter that emerged from two decades of retirement in 1977 was a very different artist from the Alberta Hunter that helped keep the race record market afloat in the early 1920s. Audiences in the ‘70s and ‘80s that flocked to Hunter’s latter day performances at the Cookery knew that she was a legend, but they were enthralled with her energy, experience, wit and mastery of phrasing. Such fans didn’t necessarily feel the need to revisit the ancient recordings that made Hunter a name. But there is every reason to investigate them, as Alberta Hunter wasn’t just another Vaudeville blues singer competing for parity with Clara Smith, Lucille Hegamin, Ethel Waters and, ultimately, Bessie Smith. She was a bellwether of a wide range of American popular song—ballads, blues, jazz, pop tunes and even purely sentimental fare. 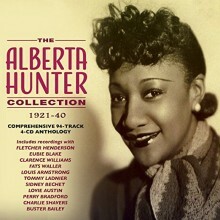 In the mid-1990s the Document label in Austria issued four single discs comprising the better part of Alberta Hunter’s 78 rpm legacy, adding a fifth more recently, in addition to reissuing single Hunter items on compilations. 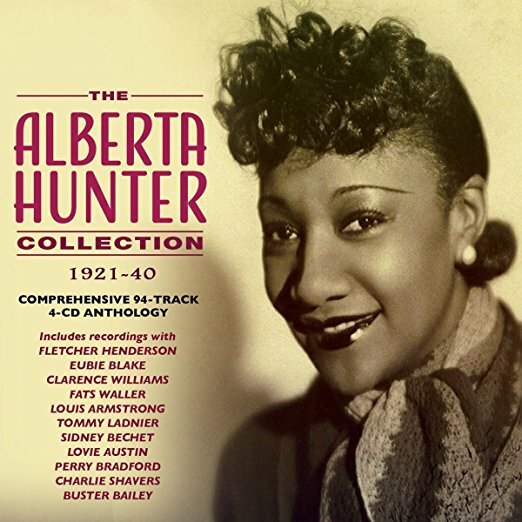 Acrobat’s The Alberta Hunter Collection 1921-40 skims the Document issues, eliminating alternate takes and adding 11 of the 12 sides Hunter made in the UK with Jack Jackson’s Orchestra in 1934. The Jack Jackson sessions are declared “of no Blues interest” in older editions of the Godrich & Dixon Blues and Gospel Records 1902-1943, but nevertheless contain some Alberta Hunter performances of considerable merit. Hunter’s early output makes for a fascinating case study in how a voice evolved side by side with developments in recording technology and currents in entertainment. Hunter made her recording debut at Black Swan in May 1921, perhaps the same day as Ethel Waters, and immediately produced a breakout hit, “How Long, Sweet Daddy, How Long?” though it would take her some time to second it. Hunter’s first great record, “Don’t Pan Me,” belongs to her third session and her first genuinely great blues performance, “Chirpin’ the Blues,” to her ninth. Some of the earliest material must’ve been a trial to record; a wayward clarinet in the first verse of “After All These Years” steps on every note Hunter is trying to sing, and in another spot an over-eager cornetist literally drowns her out. But in all of these sessions Hunter braved the storm with special enthusiasm, and that confidence eventually blossoms into mastery. Her early style once formed, to this reviewer, is addictive; Hunter’s rapid, assertive patter mixed with glissandi, gulps (an effect not lost on Libby Holman) and a quick, tasty vibrato which creeps into places where you’d never expect to find it, used in incredible variety. Hunter also emphasizes clear diction, dropping out words rather than smearing them, and this may be of lesser appeal to listeners attuned to earthier voices like Ma Rainey. But Hunter wrote many of the songs that she recorded, and clearly wanted the words to be understood. With her first true electricals at Victor—the miserable sounding Okeh “TruTone” discs, though partly electric, do not count—Hunter is at some pains to avoid belting it out as she had for acoustics. 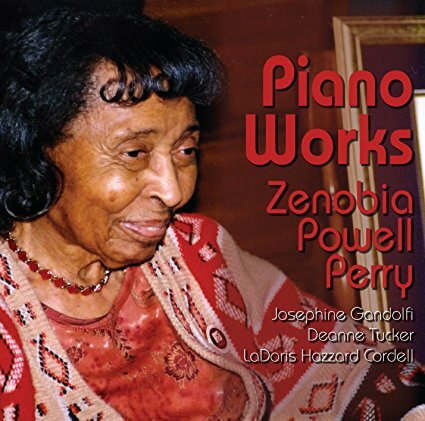 By her 1927 session with Fats Waller—arguably her best accompanist overall—Hunter had electrical recording figured out, and began to exploit new aspects of her singing; lower registers and intimacy. It’s a shame that at this point her recording activity slows to a trickle, though that is in keeping with the fortunes of Vaudeville blues women on record across the board in the late ‘20s; Hunter had better luck in this respect than some. By the time of the Jack Jacksons, she’d had some singing lessons and was now rolling her “r’s,” watching her breath control and sustaining a longer line. Perhaps the effect is less “bluesy,” but these measures no doubt helped to preserve her voice and to make Hunter’s late career possible. There are no production credits in the package, but it appears that the ‘naked’ material from Document has been put through some additional noise reduction processing. This helps in some cases, and is largely invisible, but is not so in Hunter’s first electrical session with pianist Mike Jackson. And there are places where really nothing can be done; the opening of “Vamping Brown” is musically unintelligible, with Fletcher Henderson’s piano registering only as noise from the badly worn, original 78 rpm disc. The Document issues were assembled from tapes canvassed from collectors 20 or more years ago, and in some cases it is possible that better specimens have been found in the interim; certainly there has got to be a better copy in this world of Hunter’s glorious 1923 rendering of “Loveless Love,” as it was issued on at least three 78 labels! On the other hand, for rare, unsuccessful records, copies used in this collection may still be the only ones known. Moreover, record collectors are not always apt at transferring discs, which may be why “Wasn’t It Nice?” sounds the way it does here. Despite these drawbacks, The Alberta Hunter Collection 1921-40 might well be as ideal a survey of Hunter’s first two decades in recording—of a career that lasted six and half—as one could expect to enjoy under current circumstances. It has good notes by Paul Watts, the only person credited in the package, and full disclosure—Watts quotes from some fellow named “Uncle Dave Lewis.” But beyond Watts’ good taste in source material, the notes hit the high points of her career, both as a recording artist and as a live performer, and summarize in a concise way the titanic achievements of Alberta Hunter, whose own life story is as unlikely and astounding as her best singing is intoxicating and timeless. 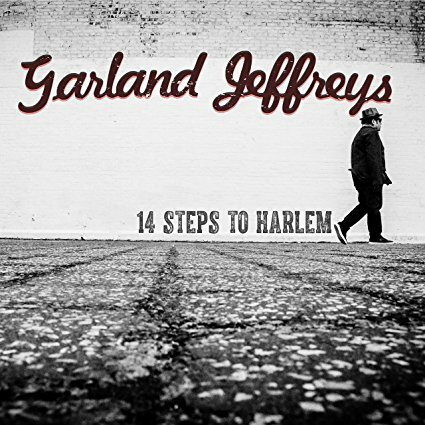 “I’m a dreamer, and I wanna tell the world about my dreams” sings Garland Jeffreys on his fifteenth album, 14 Steps to Harlem. It’s unfair to say that Garland Jeffreys is enjoying a late career boost, as in a sense he never went away, releasing in every decade since the 1960s while still taking enough of a break to raise a family. Partly crowdfunded and released on his own label, Luna Park, 14 Steps to Harlem is an exceptionally strong outing, connecting with the varied touchstones of style and genre that he employs but never in a way that can be called scattered or diffuse. Here, one finds Jeffreys exploring elements of straight up pop, grungy rock, up-tempo blues, reggae, blue-eyed soul, hip-hop beats – what have you – and any one of these tracks might be shot through with country-styled lap steel, a sound he clearly loves. Jeffreys is not comfortable with genre being the boss, and he likes to live in different musical apartments. 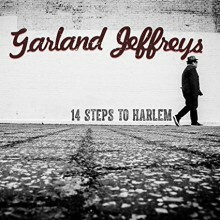 However, the overall effect of 14 Steps to Harlem is one of cohesion; the warmth of Jeffreys’ personality and the cogent spark of inspired enthusiasm behind each of these twelve selections is what pull them together. One space in which Garland Jeffreys lived was in a dorm room at Syracuse University with the young Lou Reed. Reed’s impact and spirit is keenly felt in Jeffreys’ energetic cover of “I’m Waiting for the Man” which he’s been performing for some time; I caught it during a live show he did in Northern Kentucky in November 2014 and it was a mighty intense experience which comes through here. Lou’s vestige also turns up a little in the title track, with its simple progression, laconic narration and the panoramic view taken of its subject, treated with love, not derision. Reed’s widow Laurie Anderson contributes electric violin to the album’s closing track, the classically styled “Luna Park Love Theme.” This is arguably 14 Steps to Harlem’s most touching moment; for most of this disc you cannot tell that this is a singer in his seventies, but Jeffreys sings this one softly and allows the innocence which carries the album up to that point to give way to experience in its last moments. Garland Jeffreys’ positive messages of peace and friendship are life-affirming and refreshing to hear in a climate and time such as this one we’re all in. Although I was not too sold on “Reggae on Broadway,” which seemed a mildly amusing parody – produced by Dennis Bovell, nonetheless, and therefore fully legit – 14 Steps to Harlem is a delight to behold for even the weariest of ears. In a 1990 interview, Abdullah Ibrahim stated, “I used to use very eloquent language. Then I realized that hardly anyone understood what I said.” When I first heard the track “Cherry/Bra Joe from Kilimanjaro” from Sangoma (the 1973 vinyl predecessor to this CD) on WAIF radio in Cincinnati about 1977, I certainly felt like it was communicating to me. I was a teen-aged, wannabe classical composer that loved to improvise at the piano, and I was having difficulty with balancing the immediacy of improvisation with preparing written scores which would allow for that freedom. On Sangoma—issued initially under Ibrahim’s former moniker, Dollar Brand—Ibrahim made it clear that you could make big, ambitious, para-classical statements in improvisation alone. What made it different from Cecil Taylor was that Cecil was always ahead of the audience, constantly shifting the thread of his argument from subject to subject, whereas with Ibrahim there was always a sense of moving forward in a kind of continuum, often governed by an ostinato pattern, such as in the early, minimalistic music of Terry Riley. “Cherry/Bra Joe” was not originally included on Sangoma. Though recorded on the same day, it appeared on a different Sackville album, African Portraits. 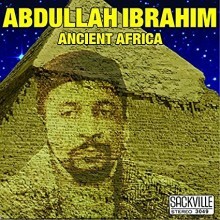 The first Ancient Africa issued as an album was the initial CD version of this from 1994, now long unavailable. This 2017 edition adds an unreleased track, “Khotso,” mainly a flute solo with some spoken narration. It illustrates some aspects of Ibrahim’s creative thinking, and would’ve been welcome on WAIF radio back in the ‘70s—though one understands why this was held back, given the limitations of album sides and that the rest of this session (“Thunder Sound, Toronto 1973-02-18”) was devoted to piano only. The next step that Ibrahim would take was pretty far from the rarefied world of Ancient Africa; in 1974, he recorded Mannenberg with a small group in Cape Town, contributing a rallying cry to the struggle against Apartheid and laying the foundation for what became known as Cape Jazz. Nevertheless, the material on Ancient Africa is well worth knowing, both as Ibrahim’s final statements—in that time—in the field of long form, avant-garde solo piano improvisation and to experience the “very eloquent language” that Ibrahim mastered, but was compelled to leave behind.